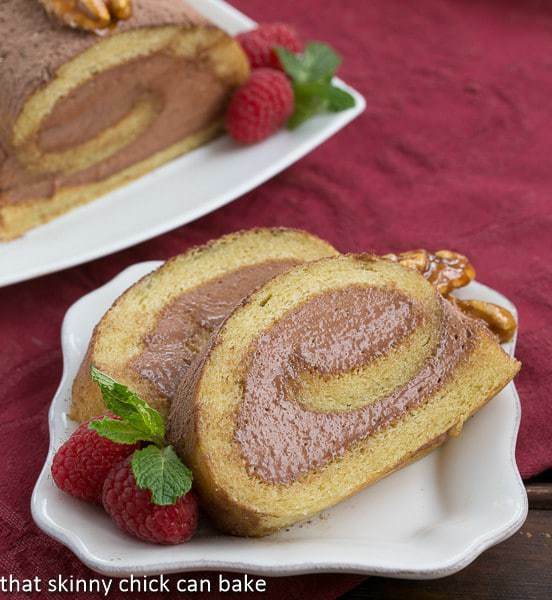 This Vanilla Chiffon Roll is filled with a dreamy walnut mousse and was hailed as a success by the nut-phobic husband! 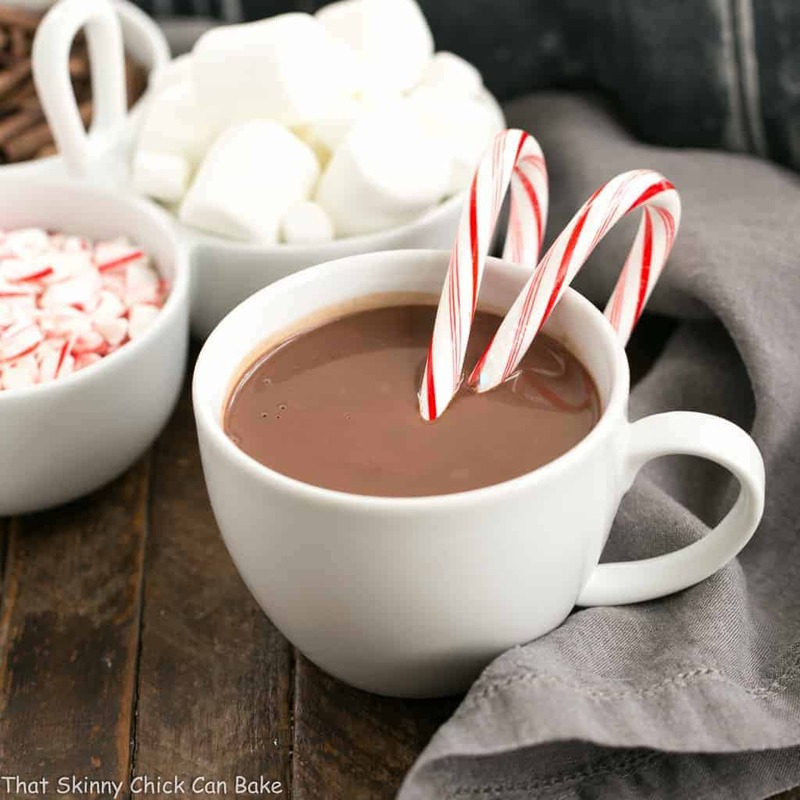 I hope you guys love this recipe as much as we did! Well, this may be a first. The hubby ate a dessert that had a heck of a lot of walnuts in it. 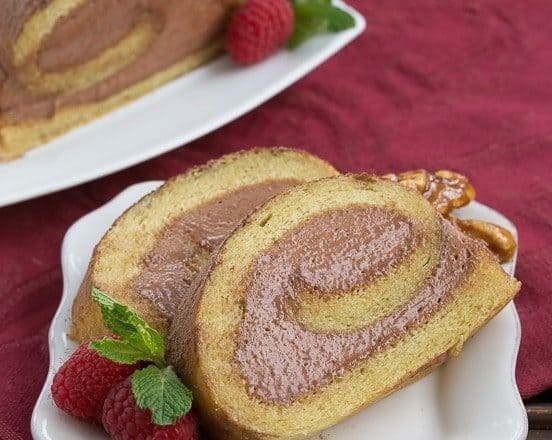 This gorgeous Vanilla Chiffon Roll is filled with a chocolate-walnut mousse. Granted, the walnuts were ground to a paste and indiscernible, but there was a cup and 2/3 of lightly toasted walnuts and even some walnut oil mixed into the filling. Nearly every bowl and spatula in my kitchen was utilized to make this jelly roll cake, but it was worth the effort and the dish pan hands. I used my half baking sheet to cook up the sponge cake, but it took nearly double the time listed in the recipe before it pulled away from the edges of the pan and passed the finger test. I either use a toothpick to check for crumbs or a light tap with my finger to see if the cake bounces back to its original position to check for doneness. This cake roll took 20 minutes instead of the 10-12 listed in the recipe to be baked thoroughly. 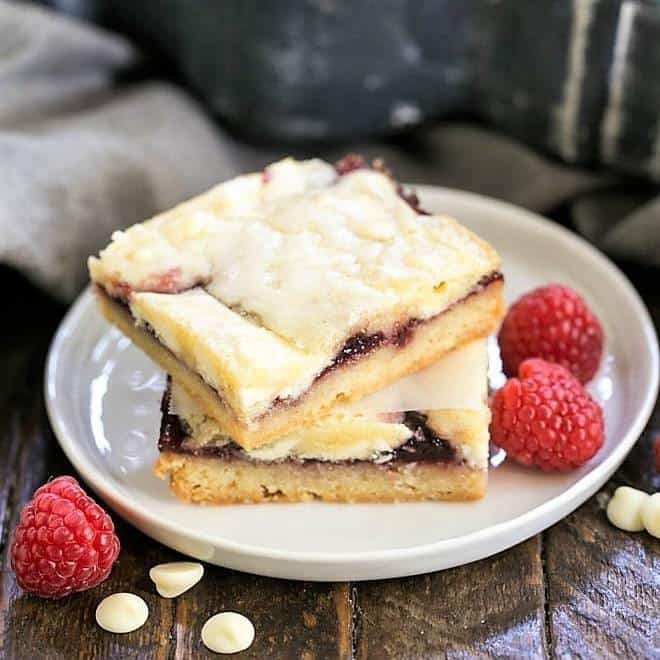 It may have been my heavy duty Chicago Metallic baking pans, so use your discretion if you try this wonderful recipe from contributing baker, Mary Bergin. The hubby thought this vanilla chiffon roll was amazing. In fact, he said I could quote him, “I like walnuts I cannot taste.” Well, YEAH….I knew that!!! Watch Julia and Mary Bergin make this recipe here. And check out the Tuesdays with Dorie site to see what the other members thought about this vanilla chiffon roll. Gorgeous roll, your mousse looks to die for! Your vanilla Chiffon roll looks heavenly. I know my family is not big on nuts either so pulverising them into a indiscernible pulp is a great idea. You always have such great natural sunlight in your kitchen and fabulous shots. Have a great week. Love walnut oil and the garnish of nuts on top. Your roll cake is perfection, Liz! Love all the walnuts in this recipe Liz! Funny how Bill ate it. It’s true that ‘eyes that don’t see, hearts that don’t feel’ like we say here. It applies to food too! One more time, your dessert looks amazing!!! I love the perfect design of your inside mousse!! I didn’t ground finely the walnuts, so I could feel them slightly, but it gives a very particular and different taste to the dessert!! Hi Lizzy, I’m awed at all the beautiful desserts, delicious foods, and yummy dips you’ve created since you went back to your icey-snow-blizzard home! (no-pun intended)…but honestly, I wish I could sit at my computer longer so I could comment every time you post an amazing creation! 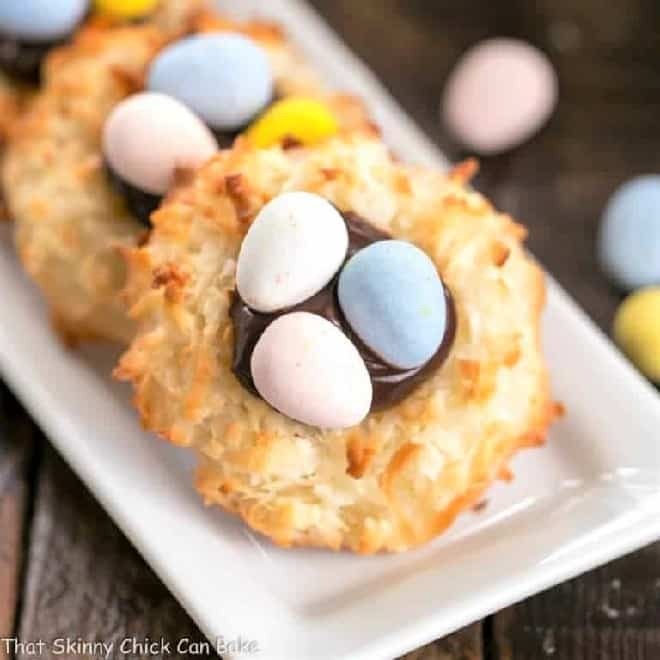 The silky smooth chocolate roll with the candied walnut design is to-die for gorgeous…your mussels (can’t pronounce in French right now) is such a famous and classic dish…love, love!!!! 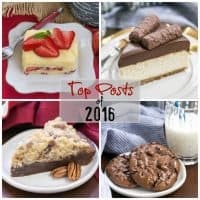 The candied bacon…yumm, the lemon bar cheesecake…another spectacular;must make!!! This chiffon roll with vanilla filling is to fill any of willingness to devour him whole. It was beautiful and very tasty. See Michael LOVES walnuts, me not so much. BUT THAT CHOCOLATE WALNUT MOUSSE looks diviiiine. Obsessed. “I like walnuts I can not taste.” It made me smile. Much as I like quick recipes, there’s something about the ones that take a long time and use up all the bowls and pans that just push the dish over the edge, don’t you think? This looks amazing. This is simply beautiful!!! I don’t think this would last a day in my house. It would keep calling me. Picture perfect, Liz! I totally agree about the number of dirty bowls, whisks, spoons, etc. 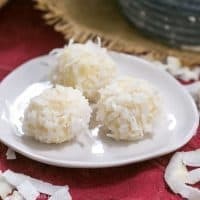 for this recipe. My kitchen was a nightmare. It was worth it, though! This looks great! Love that walnuts are in, it has to be delicious! I love your photos. The mint, raspberries and candied walnuts dress it up so much! LOL! My Husband would agree with yours on the walnuts! This roll looks relish! Especially the generous portion of chocolate filling! I was so excited that I was typing too fast! I meant delish! Beautifully done, Lizzy!! I messed up my mousse…because I wasn’t paying attention! It still tasted amazing, but was not as silky and smooth as it should have been! Your vanilla chiffon roll looks heavenly! 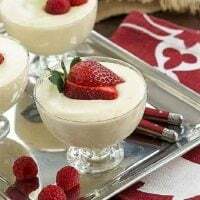 Wonderful pictures..
Another beautiful dessert. I haven’t ground walnuts like that to use in a recipe. I am going to check out the recipe now. Liz, your cake and photos are just so beautiful. A lovely chiffon roll! Will note the testing done-ness with fingertip tip for next time. Mine pulled away from the side of the pan at 15 minutes but was still too moist. i think i may still be washing bowls and spatulas! your roll looks beautiful! Seriously gorgeous dessert!!! Great job! Glad hubbie loved it! It was loved by all my testers too. It took me 20 minutes to bake too. Liz this cake roll is beautiful. I’m not a fan of walnuts either so based upon your husbands review I’m sure I’d love this. I have to say over the years of following you, your dishes are looking more and more professional. Great work and lovely photos too! Thanks for sharing. Wow. That roll looks simply amazing. That should be the picture in the recipe book. Glad the hubby liked it. Awestruck at your pictures!!! Your roll looks almost too pretty to eat :-). Agree about the baking time being off. I did not know better and even after, baking half the quantity for 14 minutes, I know it should have baked longer. It looks just perfect Liz! I love the mousse inside! 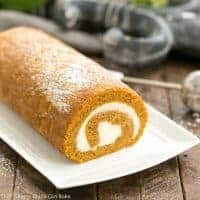 This cake roll looks wonderful. Love it ! Looks so springy and soft! The mousse filling sounds amazing. I can see why your hubby loved that!!! Wow it looks heavenly….. I like walnuts, but they really do become another ingredient when you grind them up and use them the way you did. This looks terrific! Thanks. What a beautiful cake Liz, but I have to tell you I laughed out loud with your comment about using every bowl and spatula in your kitchen! I’ve made recipes like that. How lovely that you got an unexpected home run with Bill on this beauty, who wouldn’t love a cake that looks like that? I lol’d at walnuts he couldn’t taste. Food at your house is a riot. I LOVE this roll! 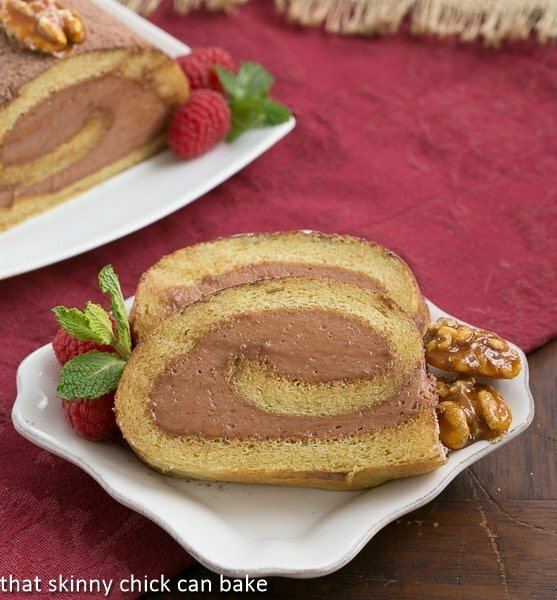 a great-looking roll– I like the top décor and your “c” of mousse in the center! was so glad that this one was worth the dish pan hands. That filling is calling to me! What a thing of beauty! I had to go see what the filling was. Yum!! Isn’t that the truth. So many pots used. But worth it. Yours is pretty. That looks like the sponge rolled perfectly – not that easy. So obviously your husband has a problem with the texture more than the actual taste of walnuts. It’s like oysters. They might taste fine but I am never going to give them a try to find out with that awful slimy texture. Liz, I’m squealing in delight over here! This vanilla chiffon roll is beyond. Beyond what? Beyond anything and everything. It’s so beautiful and elegant. I love walnuts so even if the taste of them was discernible in this roll, I’d love it. I also love the candied walnuts you have on the plate with the slice of cake. One of my favourite things to eat! It sounds like this was a labour of love in the making but it looks like it was worth every minute and dirty dish. 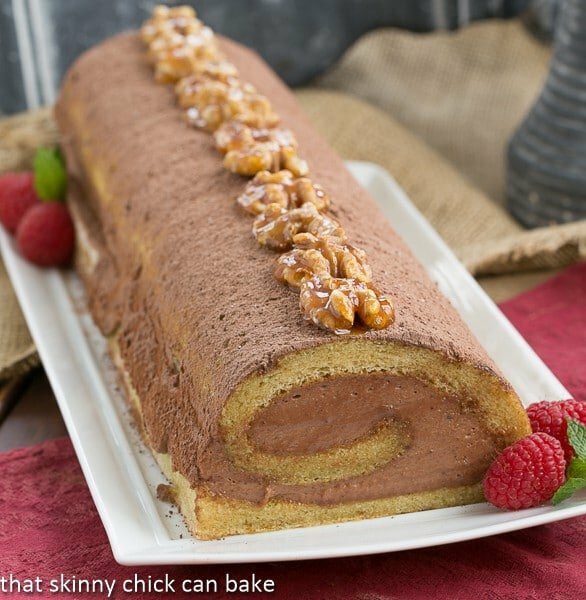 A roll cake is one of those things I’ve always wanted to attempt but have been too scared to! Now you have me wanting to make one this weekend. Yours is beautiful! Wayyyy too many dishes involved here – but your end result looks absolutely perfect! Bill is so funny and your desserts are perfect. Would love to see a video of your work, and Bill’s reaction!